Grave Location – Anglican A-31. 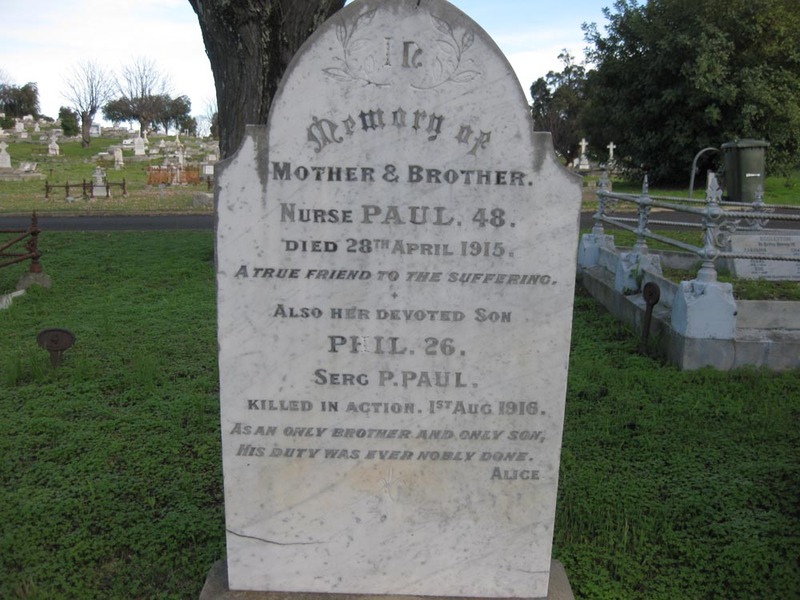 Sergeant Paul’s memorial inscription on his Mother’s grave acknowledges his tragic loss as one of the Nation’s 60,000 fatalities in the Great War of 1914- 1918. ( The words of the inscription are those of Paul’s sister Alice who was living in West Perth at the time of his loss ). Philip Paul was born in London in 1890 and migrated to Australia in 1899 with his father Philip and mother Annetta ( nee Freeland ). He worked as a Railways transport officer, was a very popular employee, and was promoted to the position of Paymaster of the Bunbury office at 21 years of age. Philip was a devoted carer to his mother, who had become an invalid, and fastidiously carried out this role until her death in June 1915. He answered the call from King and Country by enlisting for Army service ( Service No. 4131 ) on 5 August 1915. Within 3 weeks of enlistment, the Army were so impressed with his reliability and steady manner, they promoted him to the rank of Sergeant. On completion of training, Philip embarked from Fremantle on 17 January, 1916 aboard the “ Borda “. Sergeant Paul saw service on the Western Front in the Somme Region of France , with the 11th Infantry Battalion, and was sadly killed in action during the Battle at Pozieres on 22 July 1916 at the age of 26 years. His name is memorialised on one of the special walls within the Australian National Memorial at Villers – Brettoneux, France and on Panel 63 in the Commonwealth area of the Australian War Memorial in Canberra. [ Unfortunately, 2 of Philip’s cousins , who had enlisted in the Imperial Army were also killed in action during the Great War ].